The 1763 Conestoga Massacre was the brutal murder of 21 Susquehannock men, women, and children by a vigilante group of Scotch-Irish frontiersmen from central Pennsylvania (known as the Paxton Boys). 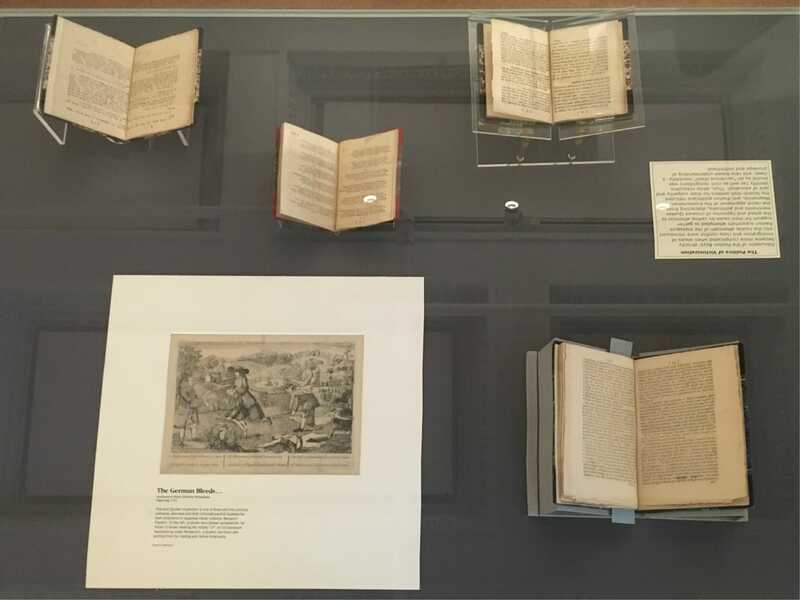 These frontiersmen and their families had settled on American Indian lands in violation of established agreements between the Quakers and various tribes. Several tribes raided frontier settlements in response to this encroachment and, in retaliation, the Paxton Boys attacked the Susquehannock, who they claimed had passed “secrets” to hostile groups. 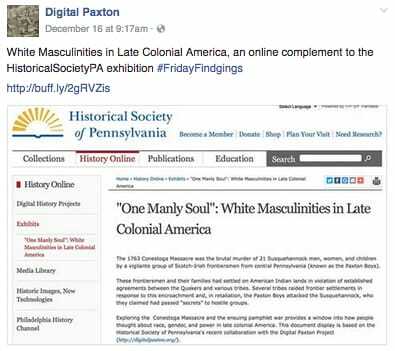 Afterward, many writers and politicians wrote pamphlets either condemning or supporting the Paxton Boys. A month after the attack, the Paxton Boys and hundreds of their supporters marched to Philadelphia to defend their actions. 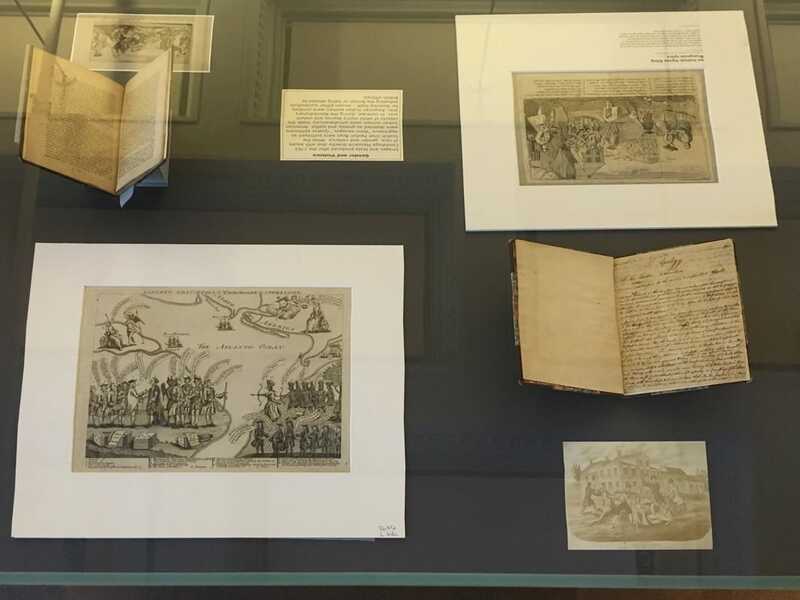 Exploring the Conestoga Massacre and the ensuing pamphlet war provides a window into how people thought about race, gender, and power in late colonial America. 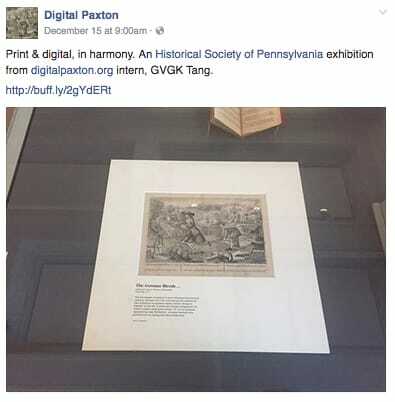 This document display is based on the Historical Society of Pennsylvania's recent collaboration with the Digital Paxton Project and is targeted towards students grades 8 and up. 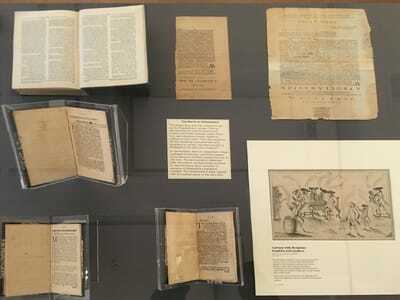 Religion was an important theme during the Paxton pamphlet war. 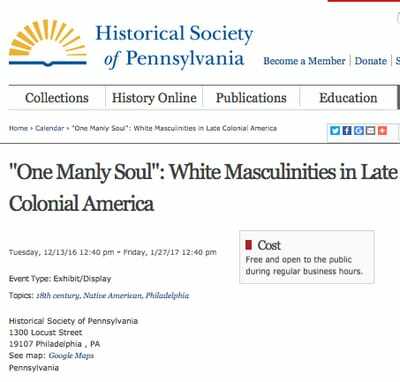 The Scotch-Irish Paxton Boys and other frontiersmen were Presbyterians, whereas many Philadelphia politicians were Quakers. 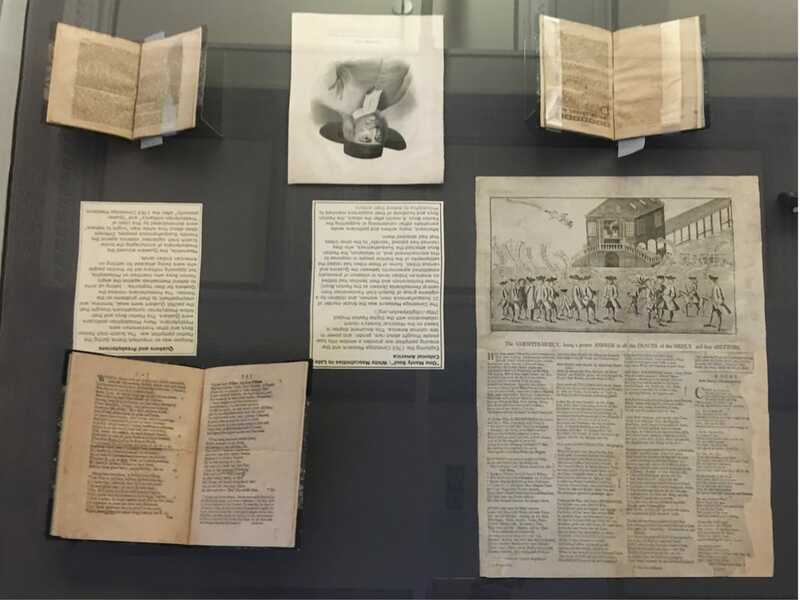 The Paxton Boys and their fellow Presbyterian sympathizers considered the pacifist city-dwelling Quakers to be weak, feminine, and unsympathetic to their problems on the frontier. 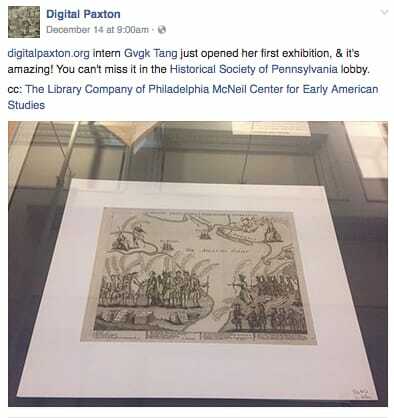 The Presbyterians mocked the Quakers for their hypocrisy – taking up arms to defend themselves against the angry Paxton Boys who marched on Philadelphia, but opposing military aid for frontier people who were being attacked for settling on American Indian lands. Meanwhile, the Quakers accused the Presbyterians of encouraging the brutal Scotch-Irish vigilantes’ violence against the friendly Susquehannock peoples. 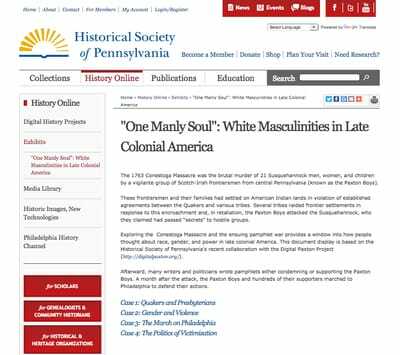 Different ideas about how white men “ought to behave” were demonstrated by this clash of “Presbyterian militancy” and “Quaker passivity” after the 1763 Conestoga Massacre. Images and texts produced after the 1763 Conestoga Massacre directly deal with issues of race, gender, and violence. While the Scotch-Irish Paxton Boys were portrayed as aggressive “demi-savages,” Quaker politicians were depicted as greedy and lustful. American Indian women were simultaneously made the objects of white men’s desires and violent acts. In contrast, during the Revolutionary War, American Indian women were symbols for America itself – shown either successfully defeating the British or being abused by British officials. 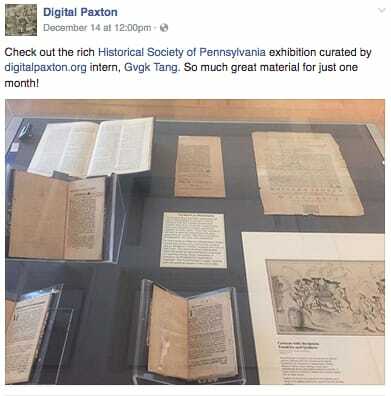 The Paxton Boys and their supporters set out to Philadelphia in January 1764 to demand the colonial government protect them from American Indian tribes who were attacking those living on the frontier. 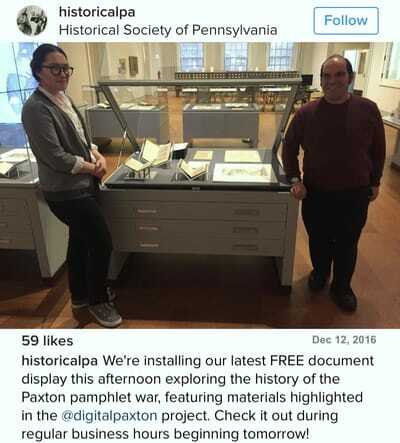 They also wanted to kill the remaining Susquehannock who, according to rumors, had been brought to Philadelphia “for their own protection.” In Germantown (then an independent village northwest of the city), community leaders led by Benjamin Franklin stopped the mob of 250 men. 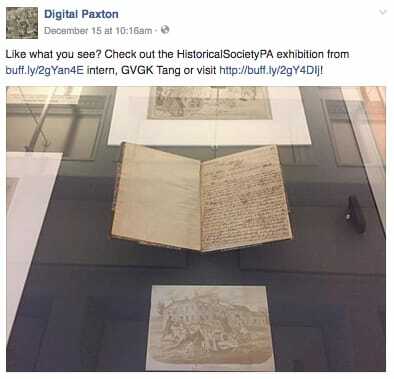 The demonstrators disbanded after the political representatives promised to read the Paxton Boys’ pamphlet of concerns in Philadelphia’s legislative chamber. The frontiersmen’s anger clashed with the political power of the city’s elite. Discussion of the Paxton Boys’ atrocity became more complicated when issues of immigration and class conflict were introduced into the hostile aftermath of the massacre. Paxton supporters attempted to gather support for their cause by calling attention to the greed and hypocrisy of crooked Quaker merchants and politicians, distracting from the racist aggression of the frontiersmen. Meanwhile, anti-Paxton politicians ridiculed the Scotch-Irish settlers for their vulgarity and lack of education. 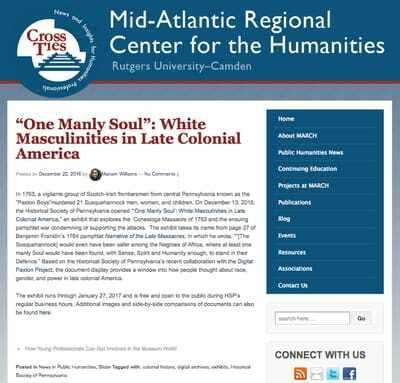 Thus, white masculine identity (as well as civic recognition) was bound by an “us-versus-them” mentality: a class- and race-based understanding of privilege and victimhood.